Fuzzy Thoughts: bunnies! puppets! squee! 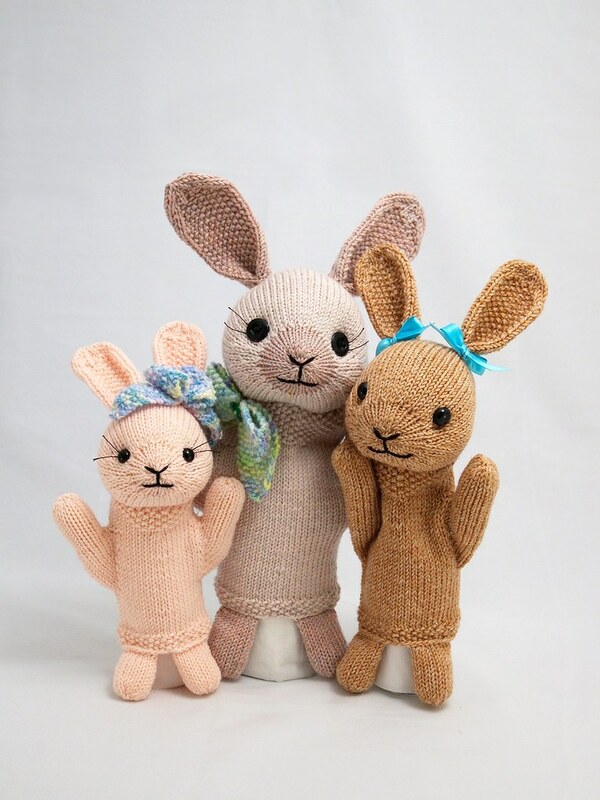 This is just a quick post to show you the new pattern I've been working on - a Bunny puppet! I think they're rather sweet, a fun toy to make for Spring, and a bit more challenging and interesting than my usual toys. I'll give you a little info now, but more details will follow later in the week when I'm ready to release the pattern. It's intermediate level, knit in-the-round, with a variety of increases and decreases. If you've knit mittens, you shouldn't have any trouble. The puppet comes in three sizes: small (about ages 3-5), medium (ages 6-8), and large (9+, also fits women's average size hands). It's knit from DK weight yarn, and should work with whatever brand or fiber you prefer. Whew! I've been trying to get this pattern done for a year and a half, and I'm so glad it's nearly ready. I do so hope you like it! Posted by Barbara Prime at 6:51 p.m.
February 15, 2010 at 12:46 a.m.
February 15, 2010 at 6:42 a.m. squeeeeeee!!!! I want to knit! February 15, 2010 at 7:28 a.m.
February 15, 2010 at 10:42 a.m.
they're beautiful Barbara - really sweet faces and perfect Easter Bunnies! February 16, 2010 at 5:29 a.m.
February 17, 2010 at 2:53 p.m.